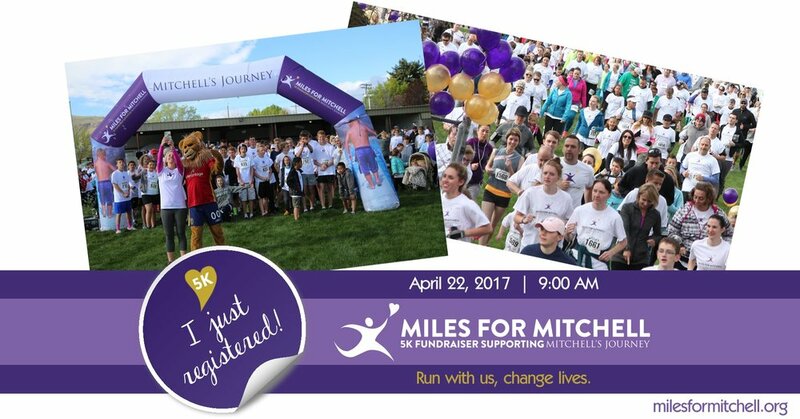 Many people would like to participate in the Miles for Mitchell 5K in Herriman, UT, but are unable to attend. For those who are in this situation, Miles for Mitchell is offering the option to do a Virtual Run. Run wherever you’re at in the world. Ideally you’d run on the day of the race, but if that’s not possible you may run whenever is convenient for you! Registrations received after April 11, 2017 might not receive their run packet before the run date (April 22, 2017). If you want to organize a group of people to run together, you’ll first need to create a team. You’ll be asked to give your team a name and to set a password for it. The name and password will be needed by anyone who joins your team. Finish filling out your registration details and payment information. During the registration process, there will be a page where you can buy extra T-shirts. This is optional. You don’t need to buy them for your team members – they will get a T-shirt when they register to join the team. Congratulations -- you are now the captain of your own virtual Miles for Mitchell team! Please note: As captain, all items (T-shirts, bibs, etc.) for you and every member of your team will be sent to your mailing address. If you want to join a team, you’ll need to get the team’s name and password from the team captain. All run items (T-shirt, bib, etc) will be sent to your team's captain.